These past few years have been a golden age for coconut oil. Everybody is beginning to realize the awesome benefits that it can have on your health that you can’t find in any other food. Coconut oil is being praised as a superfood with so many uses around the home, on our skin, and inside our bodies. No matter what type of person you are, this ingredient should be available in everybody’s pantry. We can’t hear enough about it, so what is coconut oil for your health? Because all fats are not the same. What started off as a deep fear of heart disease turned into a rejection of all fat, healthy and unhealthy, while replacing it with sugar. Starting near the end of the 90’s, the low-fat diet had skyrocketed in popularity. This is probably because of the emotional connection people made with themselves and a person they have loved that died of heart disease. But the thing about the low-fat trend is that it’s a complete farce backed by NO research or concrete evidence. This means that it is healthy for your heart to reduce red meat, dairy foods and foods processed with hydrogenated oils. This does not mean replace ALL fats with sugar, like what was done with diet foods a decade ago. In fact, sugar can be just as bad for your heart as trans fat and it’s the root cause of weight gain—the root cause of heart problems! How does this make sense, guys? I’m sorry, but this diet trend has always left me smacking my head. This is why you may see so many outrageous claims like the “cookie diet” or the “high fat diet” that recommend that you eat a lot of fat. It is supposed to satiate your hunger, but if you go overboard, there will obviously be consequences. So we also need to avoid those diets. On the other hand, healthy fats like polyunsaturated, monounsaturated, and saturated fats(medium-chain triglycerides are good for you) have been proven to do the exact opposite for your health: actually improve your cholesterol by raising HDL levels. Lower body fat. Adequate nutrition in fat will provide you an appropriate feeling of being full that can help you lose weight. Fats also regulate hormone function that works with the hunger mechanism. Improved brain function and mood. Healthy and natural fats are high in DHA, which helps provide a healthy lipid layer in the brain. This allows neurons to produce electricity and dictate everything that your brain does for your body. You will notice improved mood, sleep, depression, anxiety, addictions, etc. Stronger immune system. Natural fats contain anti-microbial, anti-viral and anti-fungal properties and have also been proven to decrease mortality rates by bacteria in mice. Many natural health experts recommend coconut oil for candida yeast infection. Improved skin and eye health. Dry skin and eyes is a common symptom of fatty acid deficiency in the body. Adequate omega-3 fats and saturated fats are needed to provide a healthy lipid layer in the skin, which essentially provides lubrication for cells and cell products. Improved cholesterol and heart health. Yes, healthy fats actually prevent heart and artery problems which may be shocking! Saturated fats will raise HDL cholesterol, which is the good kind that unclogs arteries. We all need certain fats in our diet like these to keep a balanced diet and remain healthy. It’s shocking to know that doctors have recommended diets that are lacking in one of the three macronutrients of essential nutrition. What is Coconut Oil for Candida Yeast Infection? We can see how yeast overgrowth affects us by examining thrush, body odor, bad breathe, etc. Natural health experts like Dr. Mercola and Dr. Axe warn about how Candida yeast overgrowth destroys our health due to a diet high in sugar. Skin and nail fungal infections like athlete’s foot, ringworm, etc. Difficulty concentrating, poor memory, can’t focus, etc. They all suggest using unrefined, organic coconut oil if you experience these symptoms or eat a decent amount of sugar. Coconut oil will control the yeast and contain it in your colon, where it belongs. What is Coconut Oil for Oil Pulling? There is a natural health practice called “oil pulling” in which you wake up in the morning and swish coconut oil around in your mouth for 20 minutes before spitting it out and brushing your teeth. The claim is that coconut oil has antibacterial properties that can bind to the plaque on teeth and significantly reduce the number of bacteria in your mouth. Some people even claim that this practice can treat remedies from acne to migraines. There is not much research on what this does because this is a new remedy, but until then, all we have are the most significant health claims. Some claim that oil pulling will “pull toxins” through the saliva and help detox your body. Others claim that the oil pulling will strengthen the blood flow in your head, strengthen your jaw, and whiten your teeth. I have tried the oil pulling remedy for about a month and I can say that I’ve had amazing results. The only thing is that it is very time consuming and annoying to remember each morning. If I had the energy to care, I’d swish it in my mouth for 20 minutes while in the shower before brushing my teeth. The thing is that I love to drink green tea first thing in the morning and you’re not supposed to drink anything before you do oil pulling. The oil pulling made my teeth very white like never before. Everybody was complimenting my smile. I was also noticing more clear skin and a better memory. Well… I can’t explain this, but this is just my experience and what I think it did for me. I hope that research in the future gives me an explanation for this. What is Coconut Oil for Natural Substitutions Around the Home? I really like this coconut oil. I find that it has a slight sweet flavor when added to cooking. Click the image for a discount! unhealthy fats like trans fats, hydrogenated oils, canola or soybean oil, or butter. If you are frying something, using coconut oil is always the healthiest way to go. I also love the taste that it gives food: a rich nutty flavor. This oil can also be used in skin and hair care. Many skin care experts are obsessed with coconut oil because they claim it gets rid of acne by being antibacterial, helps moisturize skin, prevents wrinkles, and so many other things. For your hair, it’s a great leave-in conditioner for dry hair or a great hair mask ingredient for normal hair. What is Coconut Oil for Me? This ingredient is an essential for my daily cuisine. I have grown a deep love for this oil since I tried to add it to my diet. At first, I preferred the taste of animal fat but then I felt MUCH healthier by using coconut oil as a substitute and now naturally prefer it. I make sure to buy raw, organic coconut oil for my oil pulling and hair care needs while I buy refined coconut oil for cooking. This is because refined coconut oil burns at a higher temperature so you can fry things. You should also try oil pulling for a few days and see how it affects your health. I saw positive benefits so you should let me know what you think as well. I am sure that you can find so many more uses for this oil because there are so many possibilities for creativity. My favorite coconut oil is this one. It is an extra virgin coconut oil, which means it has not reached high temperatures, meaning it is very fresh. This company also promises that the oil retains nutrition and is from fresh, organic coconuts. It also adds a very nice body to the smoothies I make. Perfect for oil pulling as well. This is a great article and so informative. 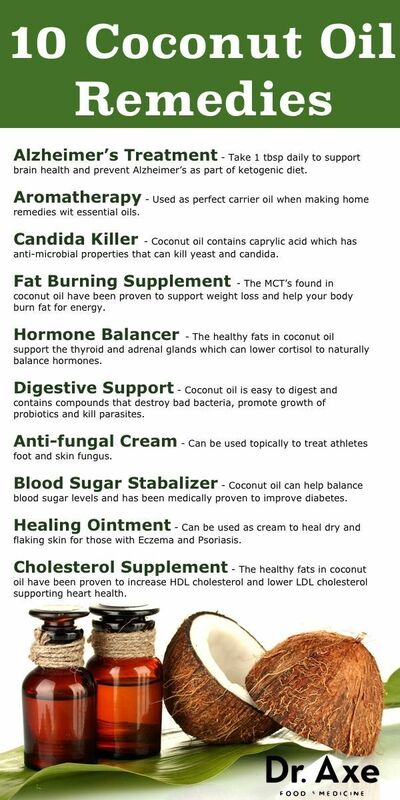 I completely agree with what you have said with regards to Coconut Oil and its benefits. I will always make sure we have some in our home and we all use it for various reasons. Myself for oil pulling, my husband as a skin moisturiser and my daughter likes to use it to make her pancakes with. I know of many of it benefits but was unaware of the benefits it has for Candida so i have learnt something new. Coconut oil has a lot of benefits for your health if you consume it in moderation. For yeast overgrowth, coconut oil is one of the top natural treatments for its antifungal properties. There is still much to learn about coconut oil, though. Thanks for the input! Very informative article. My niece was just diagnosed with diabetes, how can cocoanut oil help exactly? Coconut oil does not seem to help people with diabetes. It would also depend on the type of diabetes she has. It’s really unfortunate that she has developed this disease, and I’d recommend other natural procedures to help her blood insulin levels. Apple cider vinegar is a food product that helps diabetes greatly. It can slow the absorption of sugar in the bloodstream to prevent insulin spikes that can damage the immune system. Green tea also does the same. Hello and thanks for a very informative post, you post is well detailed and filled with good information.